Need reliable Internet phone service? Look no further than ViaTalk, at ViaTalk.com. ViaTalk prides itself on its customer service, as well as its flexibility and ease in the technology used to make your calls possible. ViaTalk provides unique features like Call Hunt, Call Record, and Enhanced Voicemail. Check out 58Coupons.com for the latest ViaTalk promotions, ViaTalk coupons, and ViaTalk coupon codes. Use this code at ViaTalk.com for a $25 discount. Click link now. 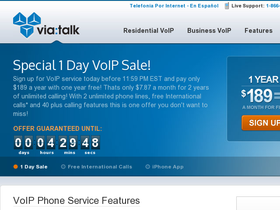 For only $8.95 a month with VT World, you can make international calls for free. Click link to visit ViaTalk.com and save. Click link to download ViaTalk Mobile for the iPhone, free! Features include Voicemail and Call Logs. Refer friends to ViaTalk and get VT Points which you can redeem for prizes. Click link to start.